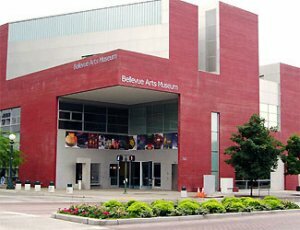 Bellevue Arts Museum is the Pacific Northwest's center for the exploration of art, craft and design. The museum is located across from Bellevue Square on Bellevue Way NE at the corner of Bellevue Way NE and NE 6th in downtown Bellevue. Two floors of free parking are available below the Museum. BAM's facilities are wheelchair accessible. Join us on the first Friday of each month! Museum admission is FREE from 11am-8pm.